East Texas Giving Day is coming up April 30! 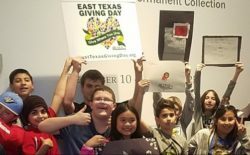 From 6:00 a.m. to 11:59 p.m., the Tyler Museum of Art will join in East Texas Communities Foundation’s online campaign to provide critical funding for the organizations that make a difference in our region. Your support to the TMA through Giving Day will allow us to continue offering Family Days, school tours, the annual High School Art Exhibition – featuring 20 schools across nine East Texas counties this year alone – and many other critical education programs to the thousands of young East Texans who depend on the Museum every year. Thanks to the generosity of the Marans Charitable Fund at ETCF, Boone & Boone Construction and numerous individuals who believe in our mission, every gift we receive up to $3,200 on April 30 will be matched dollar-for-dollar, and have twice the impact in your community!